Two Spacious Units combined creating 2,600 sq ft of absolute luxury living! Perfect for multi-generational families or home office. Shows beautifully--Professionally staged. Open Floor plan. 3 Bedrooms (2 Master suites), 3 Baths. Large Kitchen with Granite & Stainless Steel Appliances. Living/Dining Room, Separate Family Room plus Office/Den with private entrance. Gleaming 18''x 18'' porcelain-travertine flooring. New plush carpeting in bedrooms. 10' Ceilings. Lots of storage space. Community amenities include On-Site Management, Gated Entry, Security Guard, Pool, Fitness Center, Clubhouse & Sauna. 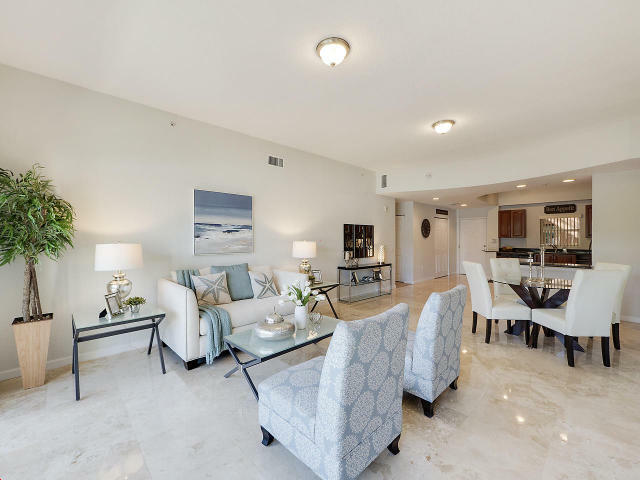 Fantastic location - near PBI Airport, the Outlet Mall, Whole Foods, 2.5 miles to City Place, 3.5 miles to Beach.